My school-friendly adaptation of Seedfolks has just been published by Playscripts. See below for details. John Newman's just-released adaptation of the novel runs 65-75 minutes and can be performed by 5-30 actors. Go to Youth Plays for everything you'll need. Tales of unafraid underdogs give us heart. And what figure faces steeper odds than a child confronting a man-eating giant? From Jack to Little Thumb to Molly Whuppie, these valiant youngsters are known worldwide. Despite being scorned for being the youngest and smallest, they're always well-armed with cleverness and courage. Paul Fleischman and Julie Paschkis tell their stories, combining sixteen variants--from Ethiopia to Indonesia to the United States--into one tale. Impossible? Check out their braiding of Cinderella versions in Glass Slipper, Gold Sandal or creation stories in First Light, First Life, both published by Henry Holt. What led to these books? My answer--from my childhood shortwave radio to folkdancing--can be found here. You can look over Julie Paschkis's shoulder and get a great view of her creative process on First Light, First Life here. A president walks into a country....but it's no joke for the rich and removed American leader fighting for reelection during the second coming of the Great Depression. Behind in the polls, he has no choice but to follow his handlers' advice: cross the country incognito, living among his people for two weeks in a desperate bid to seem attuned to their plight. Hadn't Peter the Great done something vaguely similar? What's the worst that could happen? Find out as a president steps far off the red carpet--washing dishes, picking fruit, dumpster-diving, panhandling--and discovers the nation he nominally governs. Didn't know Paul Fleischman writes for adults? Read "Swat Radio," published in The New Yorker. Available as an e-book for Nook, Kindle, iPhone and iPad, Kobo and for all devices from eBooks.com. Available in paperback from Amazon. Assassinations, student protests, the Red Guards in China and Russian tanks in Prague, a momentous election in the United States...1968 seems stuffed with a decade's worth of headlines. Young people played major roles in them, from anti-war marches and the strikes in Paris to the blossoming environmental movement and the fight for civil rights. Published on the 50th anniversary of this riveting year, 1968 brings its spirit and events to life through genres ranging from memoir to poetry. My contribution describes the long-distance bike ride I took that year at age 16, emblematic of the counter-culture's embrace of nature and personal exploration. The Matchbox Diary is an Italian immigrant's account, a hymn to literacy, an enticement to collectors, and a celebration of the box. It came from many points in my past, all of them converging at an unexpected meeting. It was two decades ago that my friend and inspiration Kathy Chilton introduced me to her fellow artist Gary Hamel, who proceeded to lift the lid off one of his matchbox journals. My eyes expanded. The cigar box contained several dozen matchboxes brought on one of his trips, each dated and holding a few objects found on that day. Though we'd never met before, I was bold enough to ask if he might let me play with the idea. He agreed. My mind began whirring. A writer's toughest task isn't finding an idea, but figuring out what to do with it. This germ overflowed with personal connections and possibilities. My mother had long ago given me a tiny sliding cardboard box she'd made and covered with paper she'd marbled, a work whose craftsmanship I aspire to whenever I write. I'm a lover of boxes and made a series of matchbox theaters some years back (see below). The smallness of matchboxes might be tied to the smallness of children and their knack for spotting little objects; I'd been the smallest kid in my class year after year. The urge to record where we've been was a possible focus. Or the way we live on through our objects--the reason my father kept his tailor-father's heavy shears close by his desk. Or a diary-in-objects might be kept by a character longing to communicate, a thread that's run through my work and my life, leading me to study instruments and languages and tutor new immigrants in English. New York Public Library's "100 Titles for Reading and Sharing"
A Spanish edition with the same stunning artwork is available from Lectorum. THE GOAL: Giving readers 14 and up the briefing they need to comprehend their moment in history. And a riveting moment it is. We've grasped the dangers of civilization-as-usual and are laboring to alter our course, veering away from fossil fuels and switching our thinking from short-term to long. Entrenched interests are resisting. It's a time of bold advances and shameful retreats, apathy and innovation. Adolescence is dramatic and untidy; so are periods when societies change. THE MEANS: Searching out the principles that decode a thousand headlines at a swoop--vested interests, the lifestyle ladder, defense mechanisms, big-country syndrome, and more. Because power and money are as important as molecules in this story, history and politics and psychology are featured as prominently as science. Because information sources vary in reliability, readers learn to look critically at the media and how to test for trustworthiness. Using my own small town as an example, the book demonstrates how to see the global in the near-at-hand, looking behind and beyond local headlines. Read the first chapter. to read and discuss: This is the one." Schools can now perform Seedfolks as well as read it. My school-friendly adaptation is large-cast (11 males, 12 females minimum), single-set, and well-supplied with female and nonspeaking roles. It's one-act, technically simple, and at 40 minutes fits into a single class period. The play is a spoken musical of sorts--for a taste of one of the "songs" see the opening scene. There's lots of dialogue, action, and new material, including the answer to the question, "What happened with Curtis and Lateesha?" The acting edition has been published by Playscripts, which will handle licensing as well. Click here for a Playscripts interview about the story's inspiration. Break a stalk! Joyful Noise: Poems for Two Voices may be the only Newbery book never to be translated into another language--but composers rushed in where translators feared to tread. Quite a few have set selections from the book to music over the years, captivating works I can now share with you. Did you think all composers are dead or that questions have only one right answer? Listen to these very different treatments of the same poem. The first is the work of Shirley Hoffman Warren, one of five Joyful Noise poems she set to music, all performed at SUNY in New Paltz, NY, where she lives. "I often strive for a slightly off-balance feel," she says--wonderfully evident here. To hear more of her work, visit her website at www.washalee.com . The second was composed by Brian Holmes and was recently performed by the Peninsula Girls Chorus in Burlingame, CA. To learn and hear more, go to myspace.com/brianwholmes. 1968: Cover illustration copyright © 2018 by James Weinberg. Published by Candlewick Press. 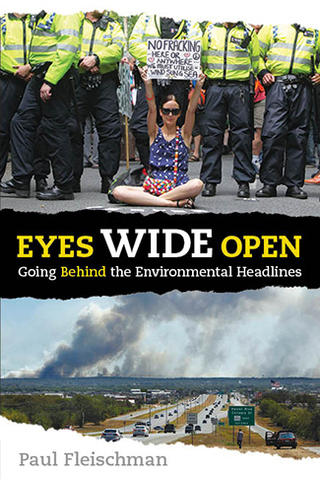 EYES WIDE OPEN: Going Behind the Environmental Headlines. Text copyright © 2014 by the Brown-Fleischman Family Trust. Reproduced by permission of the publisher, Candlewick Press, Somerville, MA. THE MATCHBOX DIARY. Text copyright © 2013 by Paul Fleischman. Illustrations copyright © 2013 by Bagram Ibatoulline. Reproduced by permission of the publisher, Candlewick Press, Somerville, MA.